We had a nice morning with clouds and wind in the afternoon. The full trip report is here. 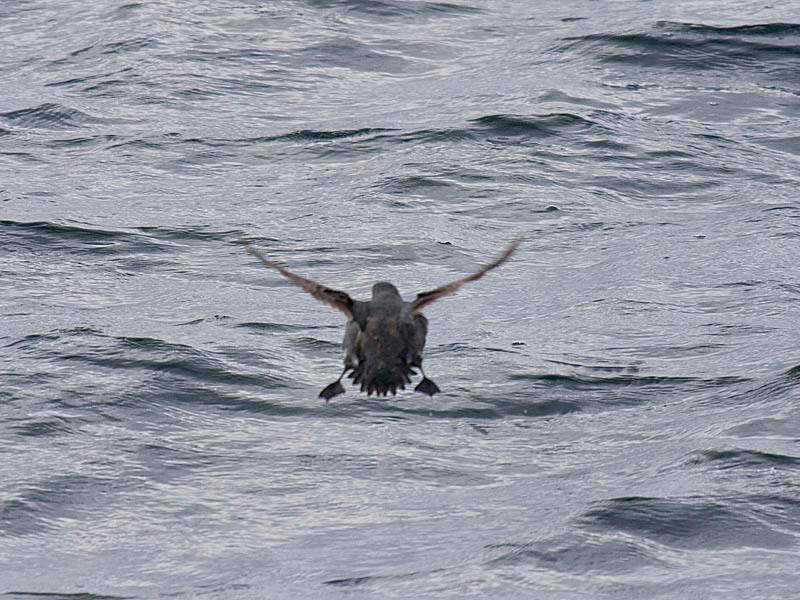 Highlights included several South Polar Skuas and good looks at a couple of Tufted Puffins. 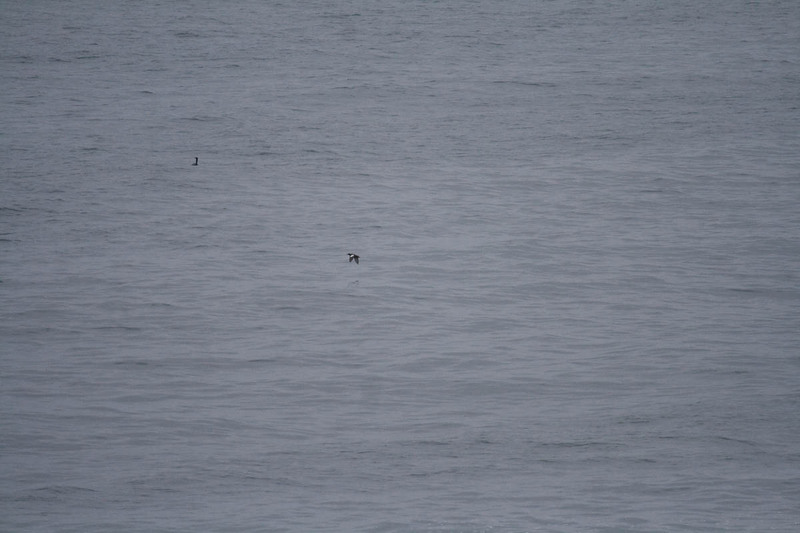 About 600 Sooty Shearwaters were widely distributed and in near-constant view from a mile offshore to our chum stop 24 miles west of Newport, Oregon. 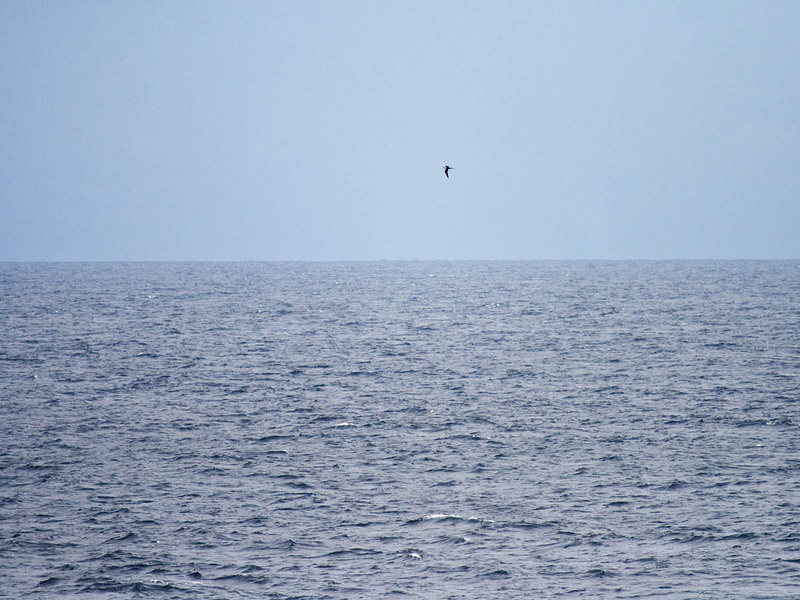 We spent 10 minutes with 3 Humpback Whales until they sounded. Overall, typical species with no rarities--a good day! 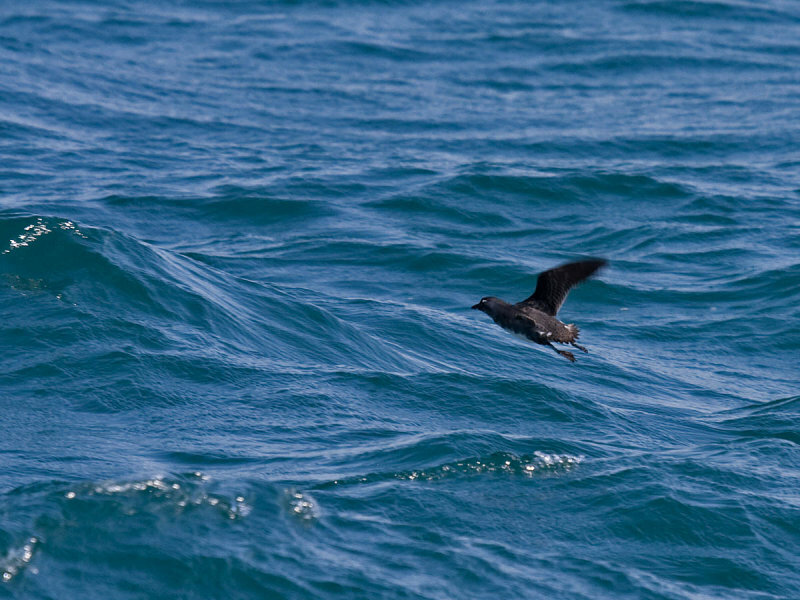 An article on Dark-rumped Petrel identification in North American Birds by Peter Pyle, Daniel L. Webster, and Robin W. Baird appears online. "Notes on petrels of the Dark-rumped Petrel complex (Pterodroma phaeopygia/sandwichensis) in Hawaiian waters" appears in the Volume 65 (2011), No. 2 issue of North American Birds. 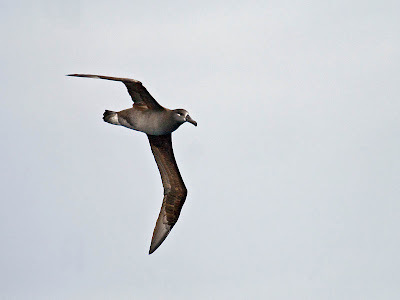 Interestingly, the authors present 2 birds from Hawaii that appear to be Galapagos Petrels. 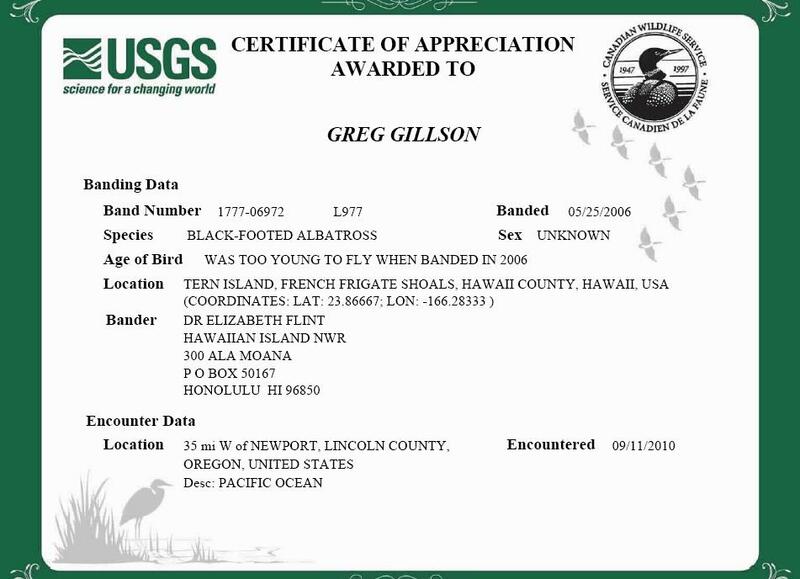 I couldn't determine whether this means these two birds really were from the Galapagos, or whether there is more variation in the appearance of Hawaiian Petrel than previously thought. 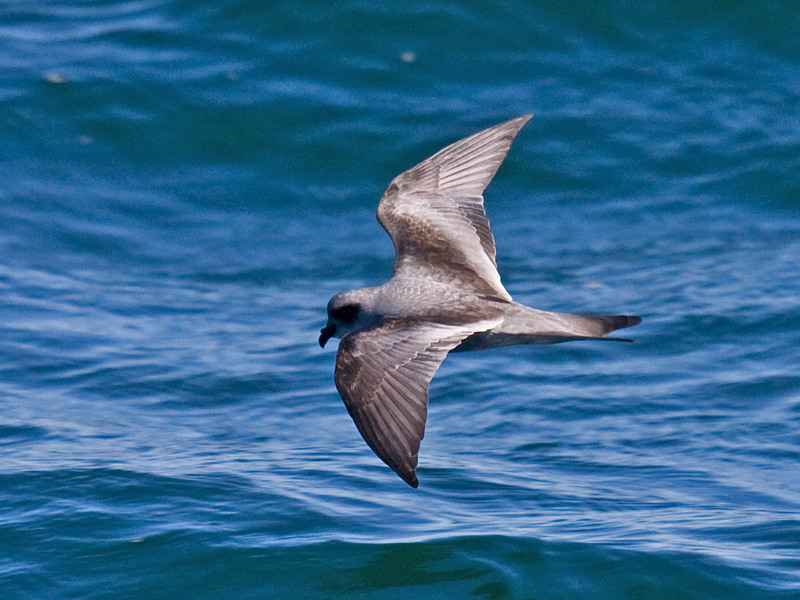 Birds appearing off the West Coast of North America, peaking about the 10th of August, have thought to have been Hawaiian Petrels, based on descriptions and photos. 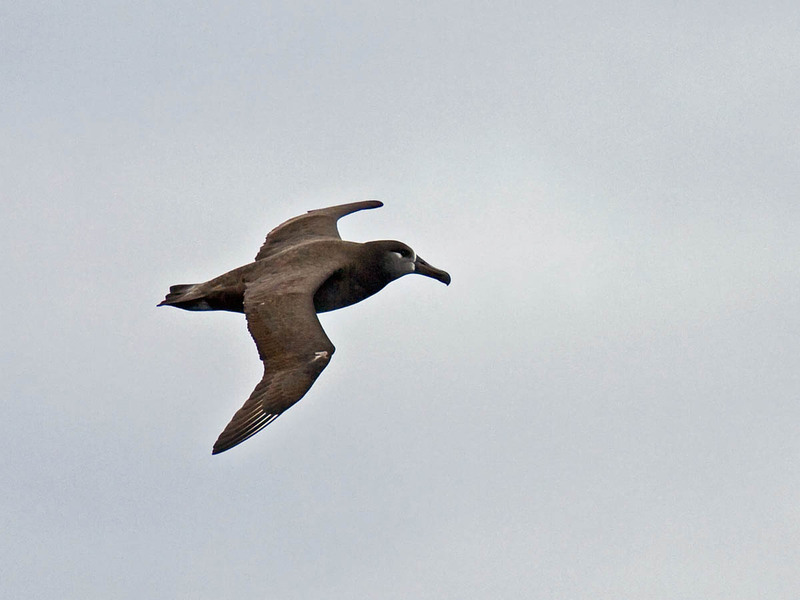 The Hawaiian Petrel has a very small population. 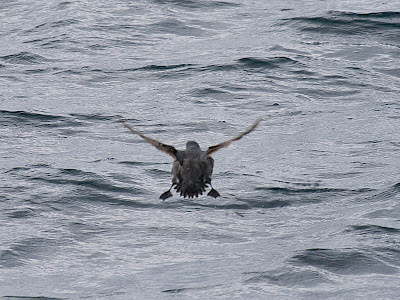 Perhaps we're better off using the pre-split name, Dark-rumped Petrel, until the identification criteria and exact ranges are more positively defined. Albatrosses use dynamic soaring as their main mode of flight, sweeping across the seas in graceful 'S'-shaped curves. 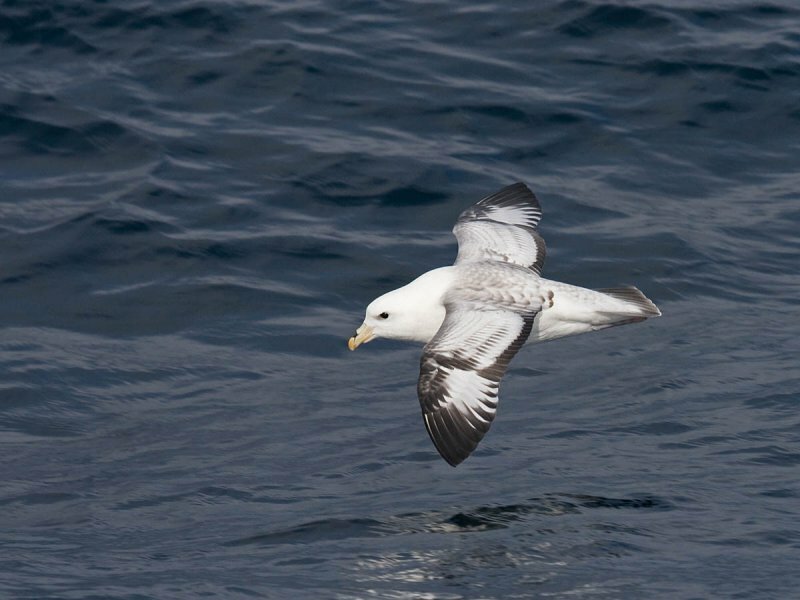 They glide low along the waves until they are just ready to run out of flying speed. 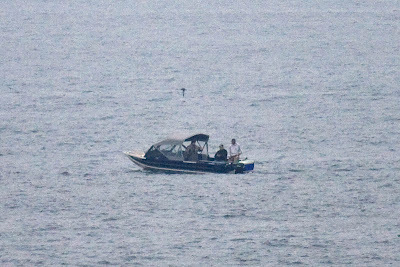 Then they wheel up to catch the winds (photo 1) and gain speed (photo 2), swooping down low (photo 3) along the water again, gliding just above the waves (photo 4). 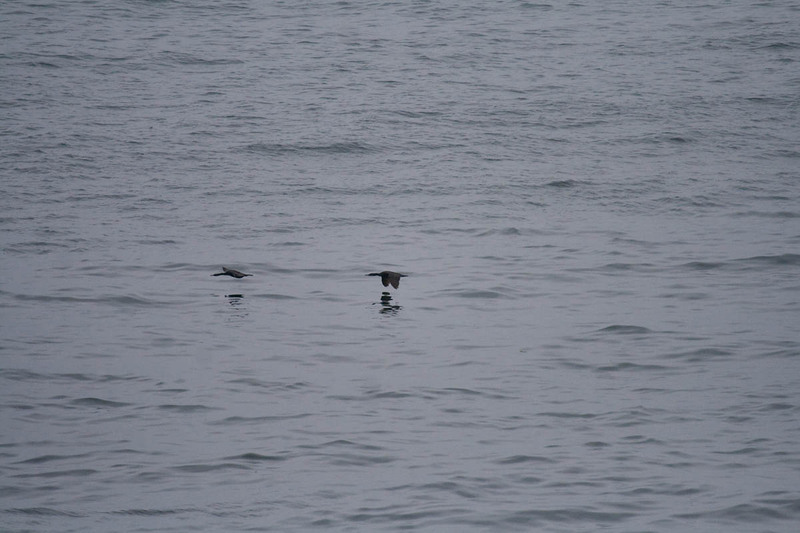 These photos of Black-footed Albatross were taken 24 September 2011 about 24 miles off Newport, Oregon. 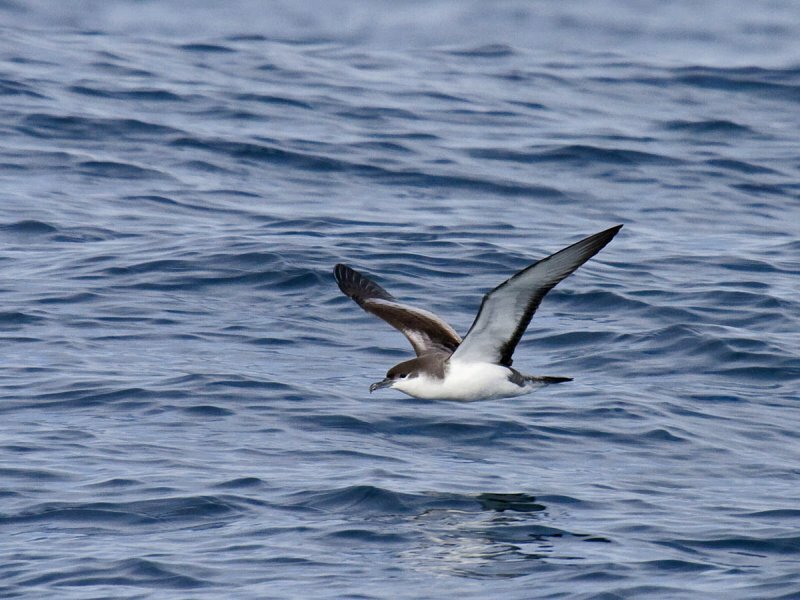 Sad news from a recent announcement by the Pacific Fisheries Management Council as reported by the American Bird Conservancy. An endangered Short-tailed Albatross was killed as bycatch off Oregon this past spring. Once numbering in the millions, they were hunted to near extinction in the early 20th century. Their numbers have built to nearly 3000 today. "Bycatch" is the name for all the fish, dolphins, birds and other animals that were not the intended fishing target. 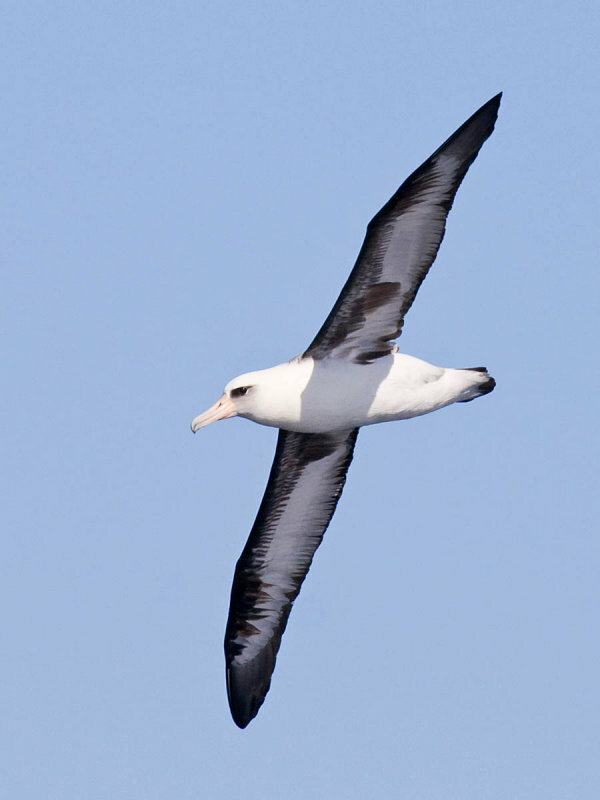 These "accidental catch" can be hauled up in nets or caught on baited hooks, as this albatross apparently was. 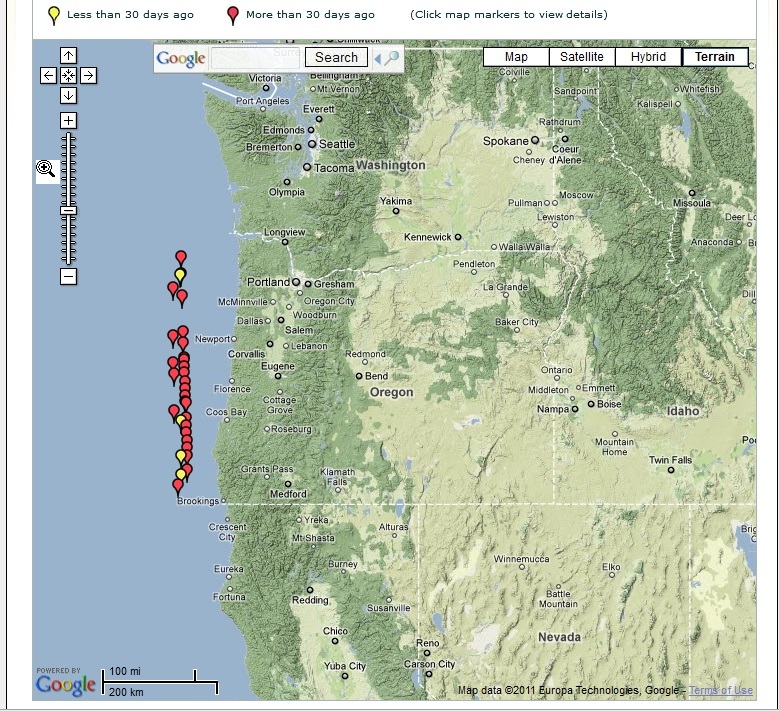 I was previously unaware that any longline fishing was done off Oregon. 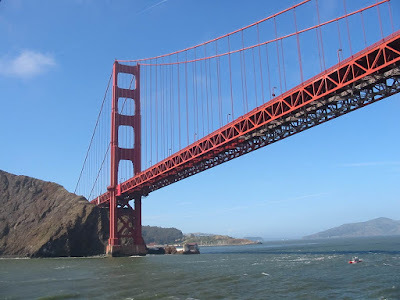 In fact, I thought a ruling in October 2002 prohibited longline fishing off Washington, Oregon, and California. So this must be an experimental longlining hake fishery. 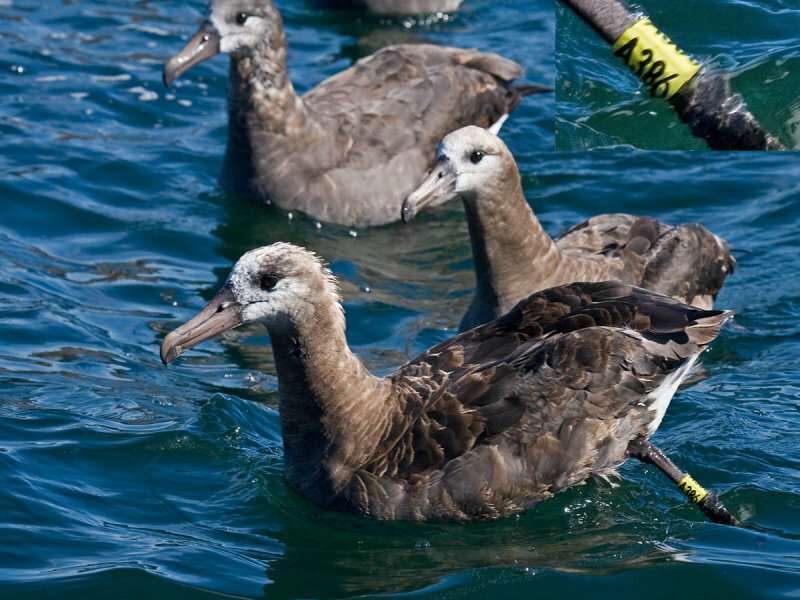 Of course, the albatross that was killed was probably an all-dark juvenile, not the white, gold, and black bird in the photo accompanying the ABC article. 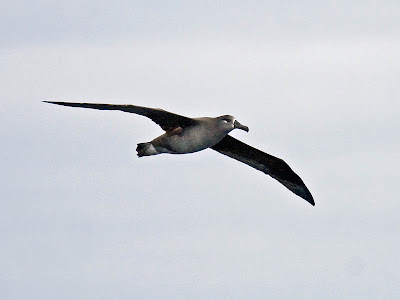 There are only 17 reports of Short-tailed Albatross in Oregon, though they are increasing in recent years and are probably offshore late fall through spring in small numbers when weather prevents many smaller vessels from going offshore to look. I appreciated the remark by Robert Alverson, Executive Director of the Fishing Vessel Owners Association in Seattle, Washington. He said, "Albatross bycatch benefits no one, and our fleets are very interested in minimizing any negative impact on seabirds." 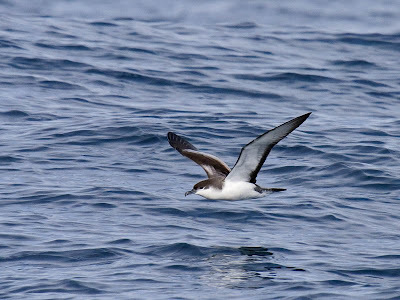 Indeed, US fisheries have made significant progress in the past few years reducing seabird bycatch, especially in longline fisheries off Hawaii and Alaska. 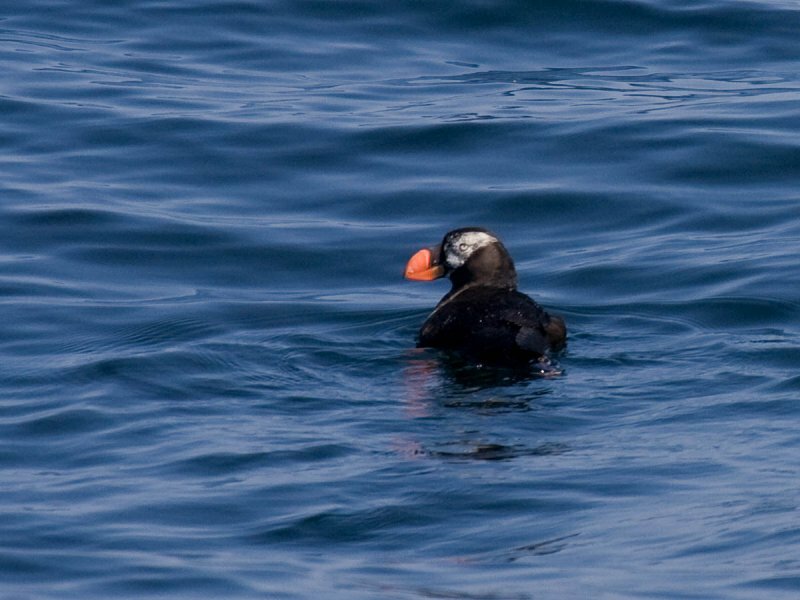 For more information: Report on the Bycatch of Marine Mammals and Seabirds by the US West Coast Groundfish Fleet. 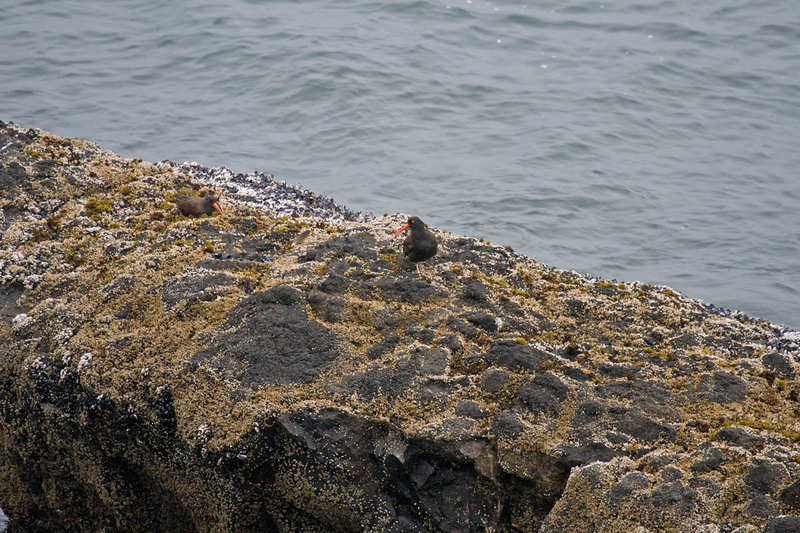 You will likely have to see hundreds of Cassin's Auklets before you see one this well. Photo 8 August 2009 by Greg Gillson. 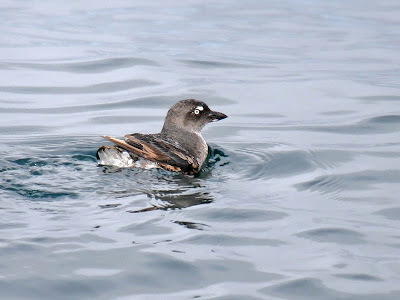 On the water, Cassin’s Auklet is a pudgy, round, gray ball. It is similar in size, shape, and coloration to a tailless juvenile European Starling, or a dark gray rubber bathtub duck. The head rests on the front of the body with no visible neck. The bill is rather short and thick at the base. The breast is dark to the waterline, fading gradually along the sides to the pale under tail. The white eyes and eye crescents are surprisingly visible. This is the view as shown in the field guides. Go ahead and look, but you'll never see one like this. Why? The bird above was photographed at 1/1000th of a second. Your eyes don't work that fast and these twitchy little birds don't hold still very long! Combine that with rough seas and a bouncing boat, add some wave splash and spray, magnify all that movement by 7 or 8 times (the magnification of your binoculars), and it's no wonder that even after several pelagic trips where Cassin's Auklets are recorded, many seabirders still haven't gotten a good look. When The Crossley ID Guide was published earlier this year, I discovered that Richard Crossley created an entire book of photos I had been deleting! His book showed only a very few birds at close range and tack-sharp focus. Instead, he showed birds as they actually appeared in the field--at odd angles, flying away, half-hidden, far away, and blurry! Pfft. I can do that! 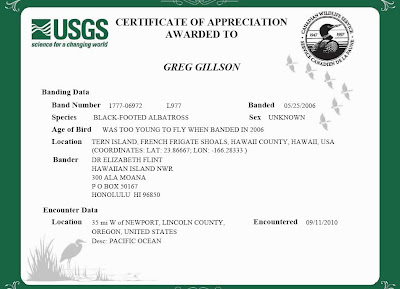 So here is the identification description of Cassin's Auklet, edited from my never-to-be-published book, the working title of which is: Seabirds of Oregon: A Field Guide to the Tails of Fleeing Alcids. 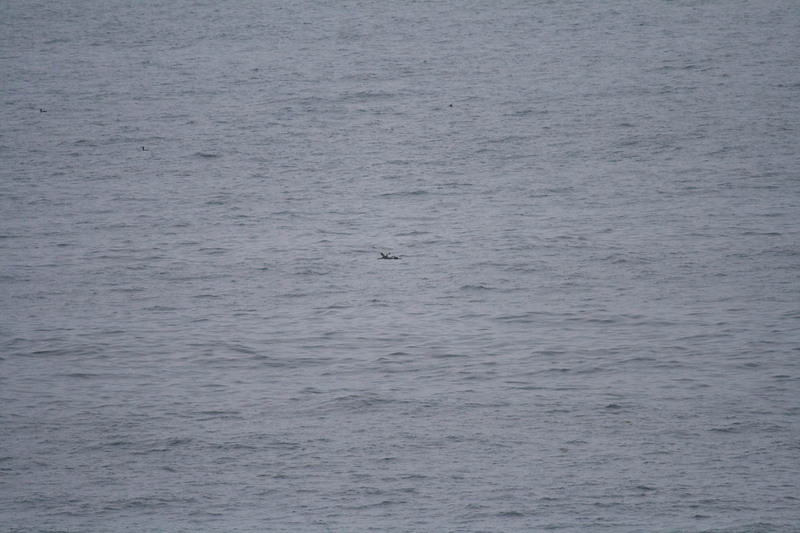 It is accompanied by several realistic photos of Cassin's Auklets--yes, at odd angles, flying away, half-hidden, far away, and blurry! Cassin's Auklets are widely distributed from near shore to far offshore. Usually, though, the distribution is uneven. 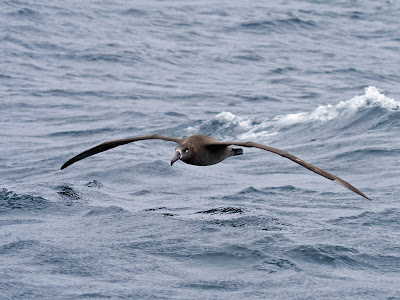 During a typical pelagic trip the boat may travel through “bands” of birds, when a dozen or more may be seen in a 10-minute period, separated by hours with none. 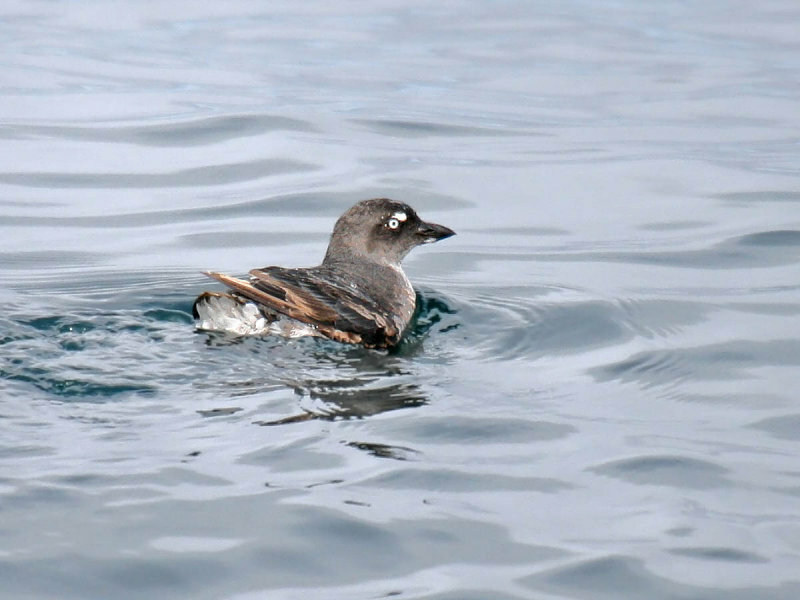 Cassin's Auklets spend much of their time diving underwater for krill. 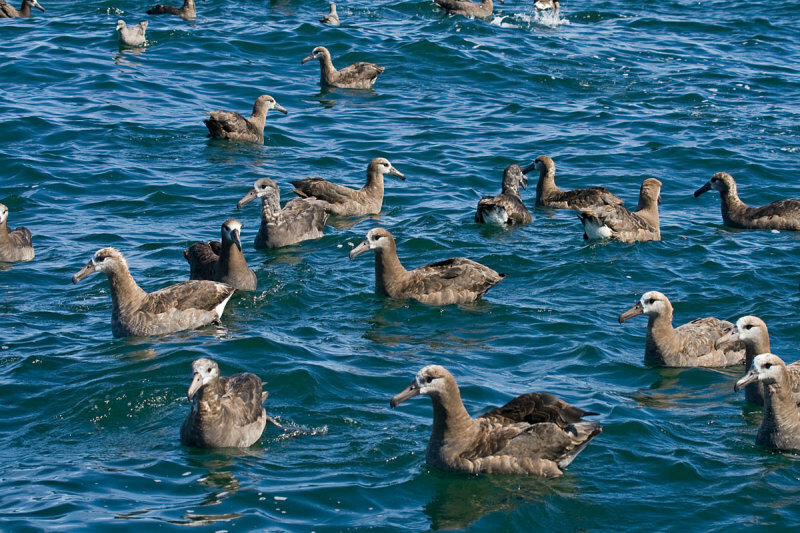 Like other alcids, these birds are skittish and flee the oncoming boat. 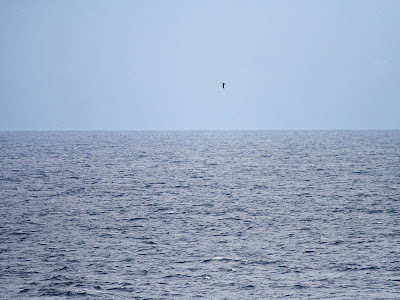 Thus, look for birds taking off several hundred feet in front of the boat. If the birds were under water as you approached, they may pop up for a breath and dive back down, with only their head coming out of the water. All you may see is a splash and a brief instant of feet sticking out of the water. 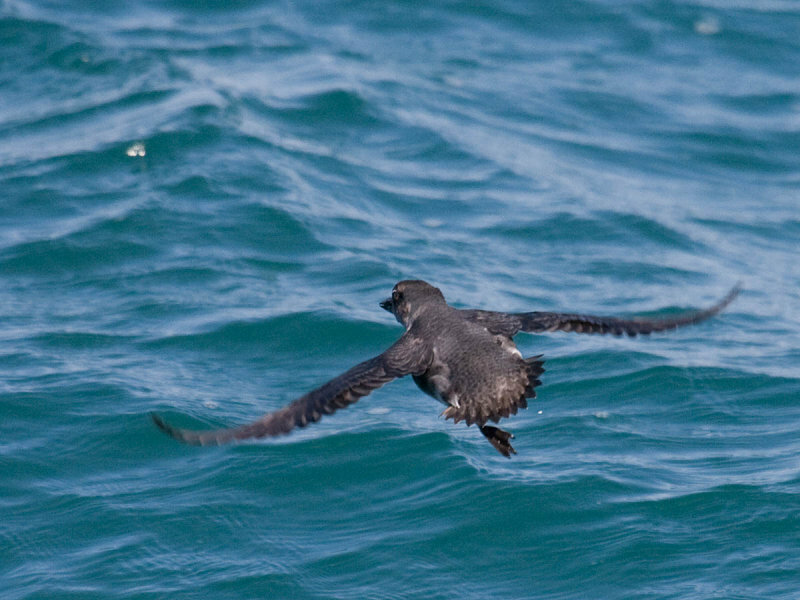 Cassin's Auklets run on the water into the wind to take flight. Fleeing in front of the oncoming boat they flap their wings frantically, like oars rowing in the water, and run strenuously on stubby legs, creating an impressive long trail of splashes. All this flailing effort does not necessarily lead to flight. They may just have gorged on food. They may be molting flight feathers. The water may be too rough. The boat may be gaining on them too quickly. 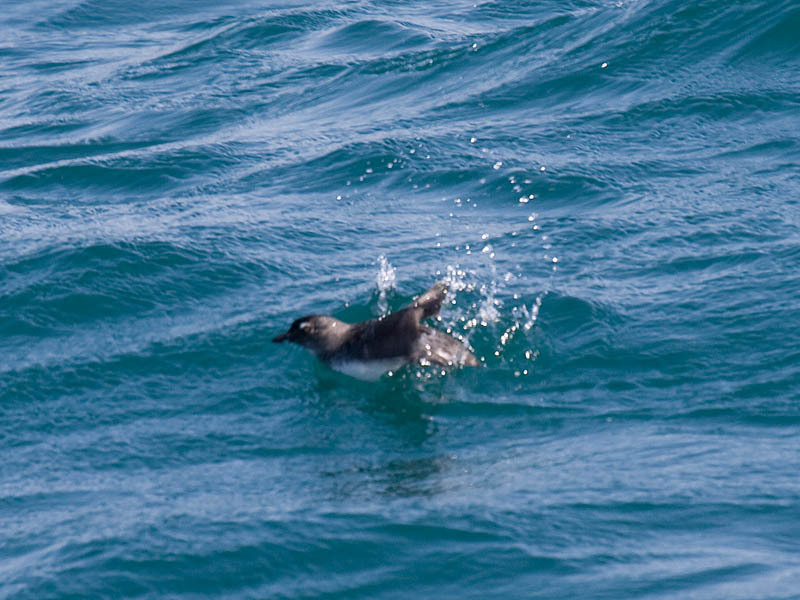 Cassin’s Auklets often have trouble getting airborne. They may bounce off the water several times before gaining enough speed and elevation to rise up above the small wavelets that reach up to slap them down again. 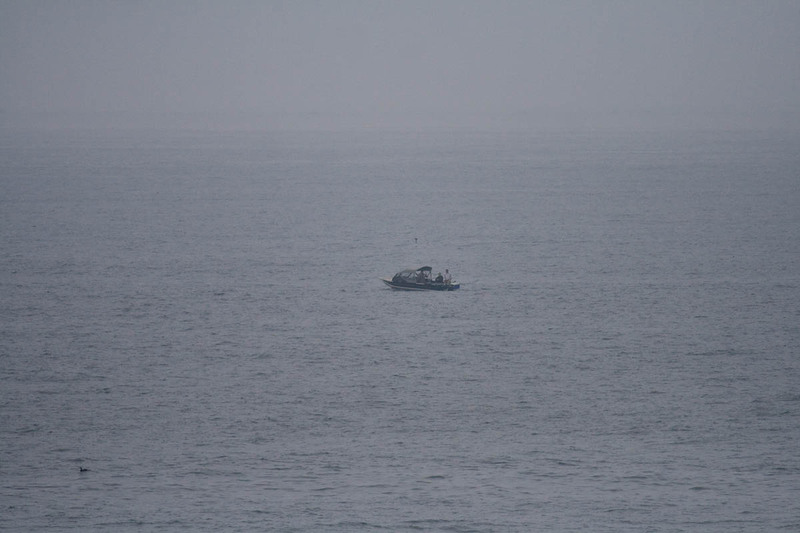 As the boat gains on them they often give up their doomed efforts at flight and dive under the water to safety. 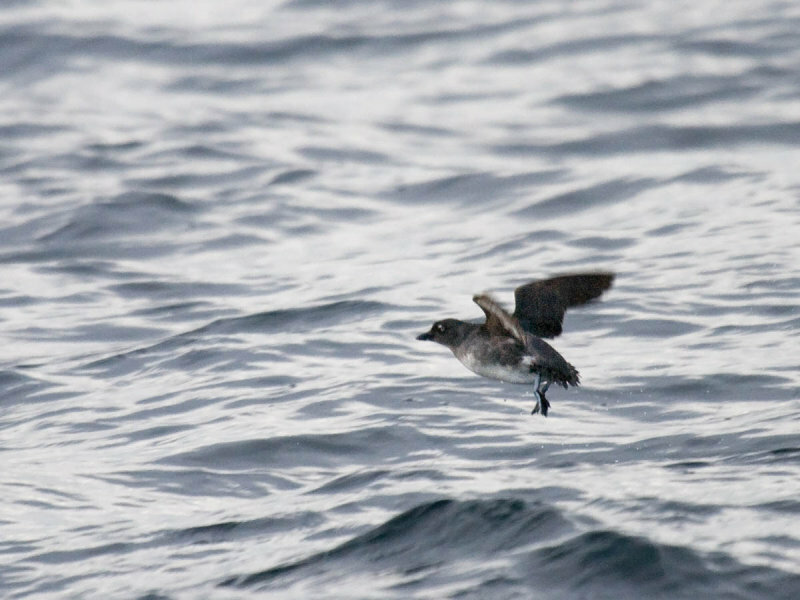 If, by some miracle or accident, the bird does become airborne, the Cassin’s Auklet in flight is a flying potato. It is a tailless, headless blob. The whirring, small, rounded, Popsicle-stick wings are just a propeller-like blur. 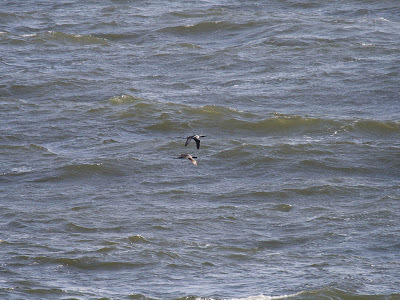 Flight is relatively slow and fairly low along the water, no higher than necessary to clear the wave crests. A flying potato with whirring Popsicle-stick wings. In low-angle morning or late afternoon sunlight the underparts can appear surprisingly white. In addition, a silvery sheen may show in the middle of the underwing panel if the observer is looking directly at the side of a well-lighted bird in flight. 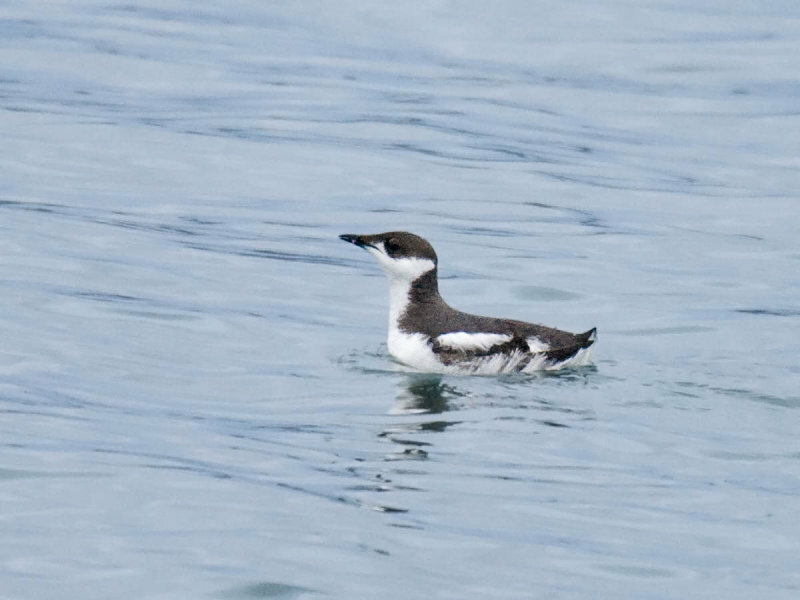 Under these conditions the bird may be mistaken with Ancient Murrelet. Pale feather-wear crescents behind the wings (where the folded wings lay) give the appearance of pale flank or rump patches on birds flying away. 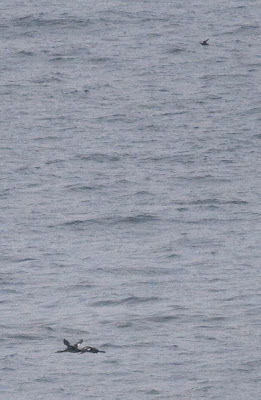 Cassin’s Auklets, and alcids in general, are more visible on West Coast pelagic trips in late afternoon returning to port. Often the seas appear smoother traveling east with the wind and waves, and with the sun or bright skies to your back. At other times, it is easier to observe birds on the water between 20 and 45 degrees on either side of the reflected sun. The seas at that angle appear very pale and bright, and the dark alcids show up better there than at 180 degrees from the sun where the seas appear dark. So the place to look is in the smooth, bright water, but not directly into the sun. 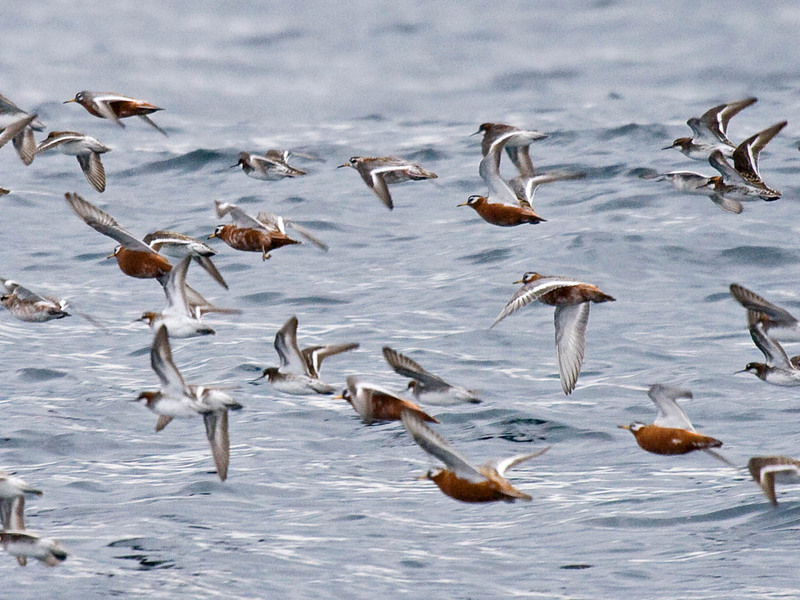 If you want to try your luck onshore, alcids, and seabirds in general, approach nearer to shore at night and move offshore first thing in the morning. The best time to watch seabirds from shore is just after sunrise, with the sun to your back. Cassin's Auklets are especially numerous in September and October off the shores of the Pacific Northwest. Search for a slight headland near the water, such as at Boiler Bay, Oregon. 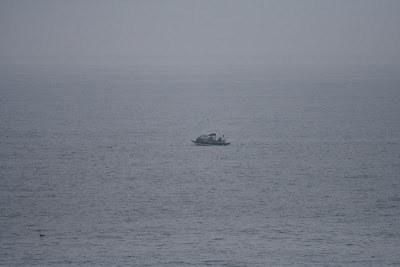 The trip from Newport, Oregon, on Saturday, September 10, 2011, started foggy with fairly large swell, which made the first portion of the trip uncomfortable and relatively birdless. 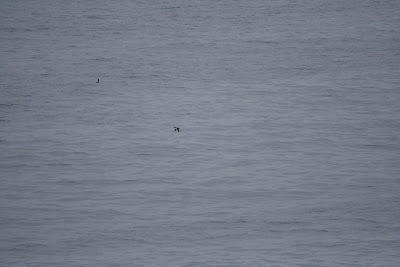 Early in the trip Tim Shelmerdine spotted a XANTUS’S MURRELET in the fog. 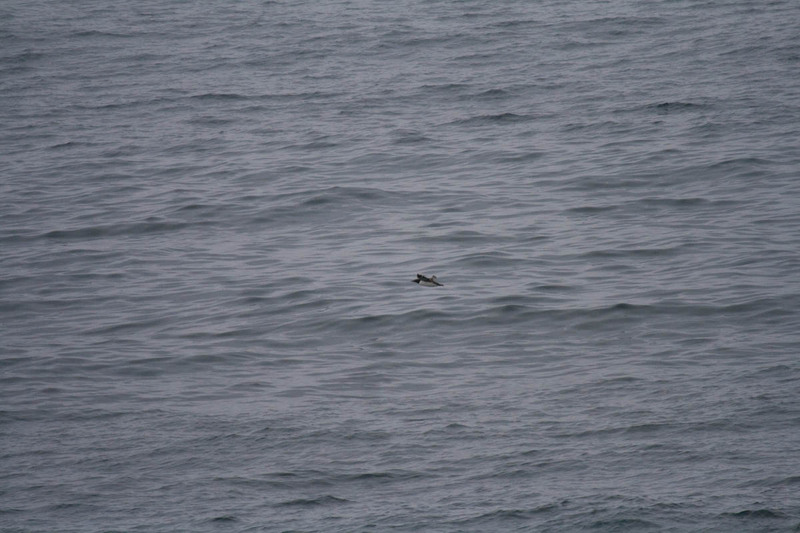 CASSIN’S AUKLETS fled from the boat during this portion of the trip, and were seen nearly constantly the rest of the way. 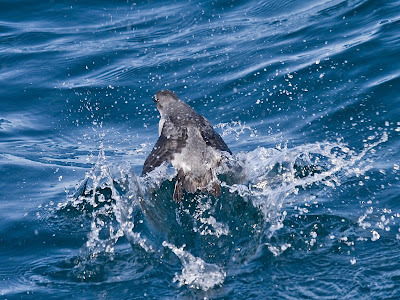 The fog burned off about 10:30 AM and immediately albatrosses and fulmars found us and we began our chum stop in 200 fathoms of water about 25 miles due west of Yaquina Head. 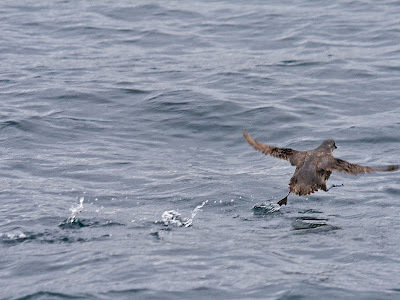 We had two SOUTH POLAR SKUAS come right in to our chum and sit down for great photos. 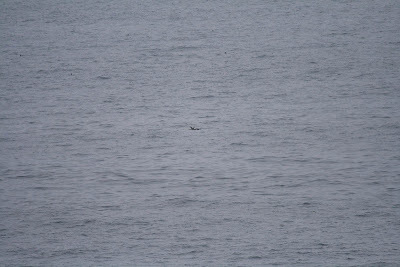 Two others were seen at a distance. All three JAEGERS visited us here, as well. 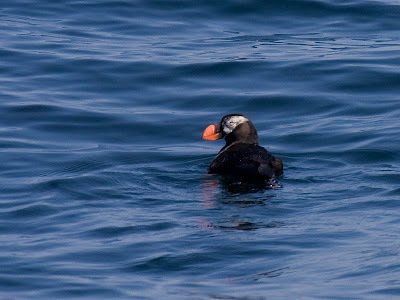 A cooperative TUFTED PUFFIN allowed prolonged views on the return, and two HUMPBACK WHALES were not too far, while others spouted in the distance. Smoother seas and sun comforted us on the return. 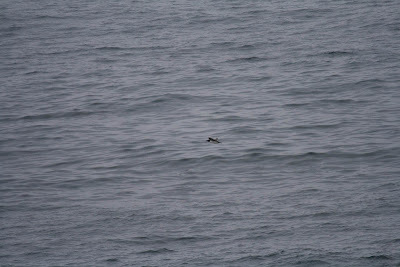 Near shore the swell was high again and we had rather poor views of MARBLED MURRELETS. 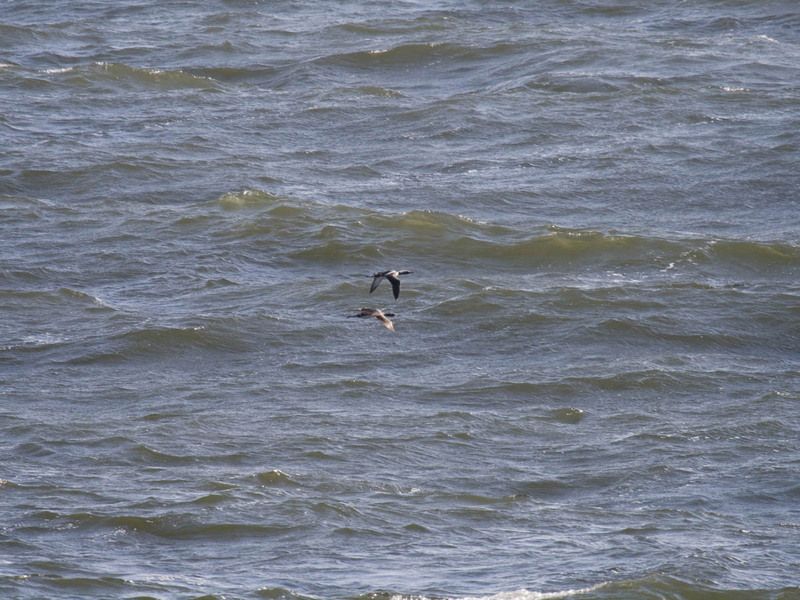 Much farther away, 5 ELEGANT TERNS were diving into the breakers near NYE Beach, about 3/4 of a mile distant from us, unfortunately. A complete trip report is here. For more information, please see The Bird Guide pelagic site. 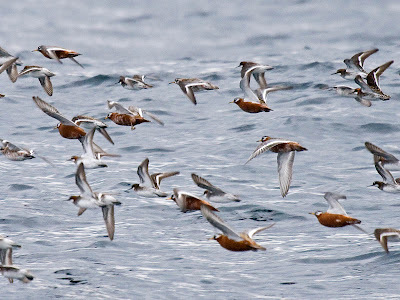 It was a foggy and windy morning for this 5-hour pelagic trip from Charleston, Oregon, for the 25th annual Oregon Shorebird Festival. 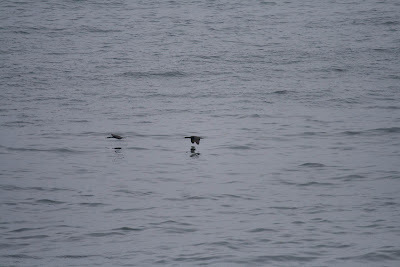 Nevertheless, we 33 birders saw nearly all of the expected species for this time of year, albeit, most in low numbers. We also broke out of the sun about 9 miles offshore as the water warmed. 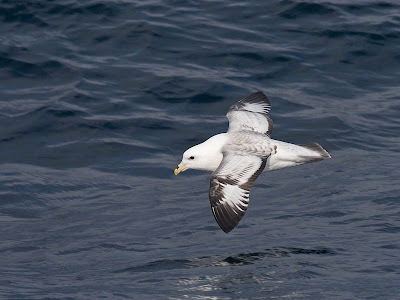 This trip went out 12 miles where we stopped to chum in the albatrosses and fulmars to the boat. I didn't even get out my camera, but passenger Lois Miller put together a nice photo journal of the trip. 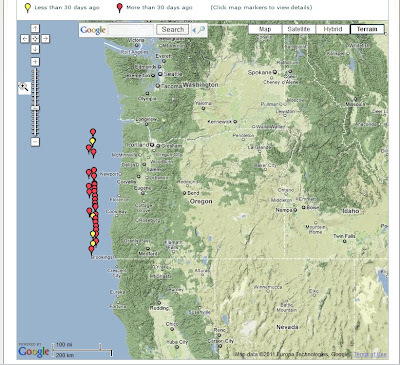 Are you visiting the central Oregon coast for a pelagic trip and want to know where to find other goods birds? I have created the Central Oregon Coast Birding Guide just for you! This guide builds upon the information in the Oregon Coast Birding Trail brochure. It is more in-depth and concentrates on the best areas. After the main listing of birding sites and regular birds, the guide is followed by a target species list with the best areas named with seasonal or habitat comments. 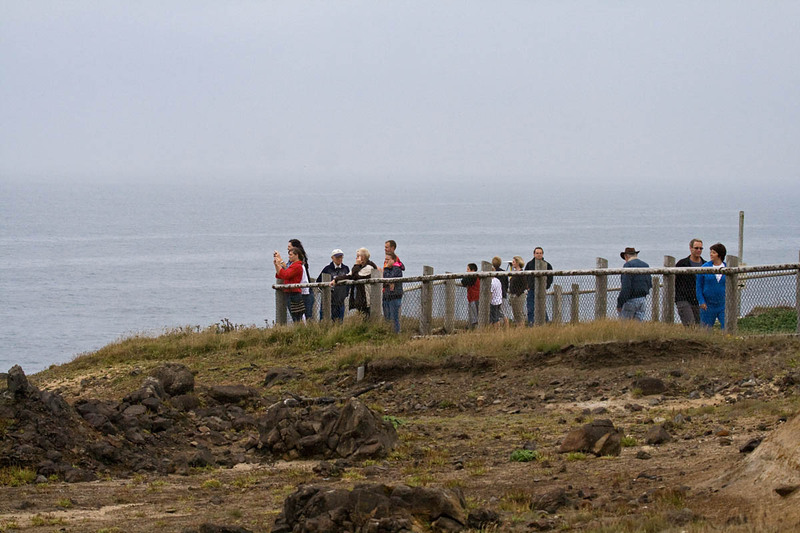 It closes with a few comments on Oregon coast bird ID problems that often confuse visitors or beginners. Recently I queried Janess Eilers about the number of charter fishing boats in Oregon. Eilers is the Registration Operations & Policy Analyst for the Oregon State Marine Board, who is responsible for licensing charter boats. 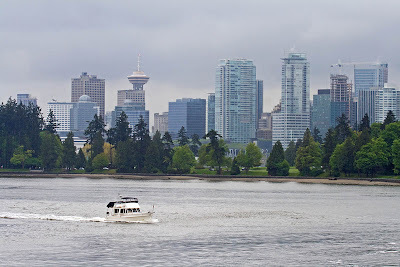 In March 2011 there were 243 licensed charter vessels in Oregon. Of these, 210 were "6 packs," smaller vessels carrying 6 or fewer people and not requiring Coast Guard inspection. That leaves 33 larger Coast Guard inspected vessels. 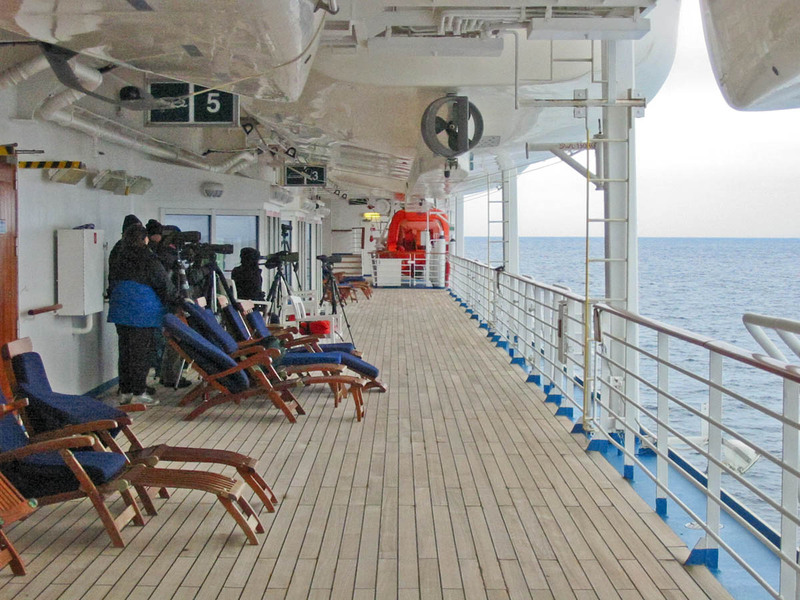 Birders use only 3 of the larger boats for pelagic birding on less than 10 days out of the year. That seems insignificant compared to the total number of boats available and the total number of trip days available on all those boats in a year. According to the 2006 National Survey of Fishing, Hunting, and Wildlife-Associated Recreation there were 30.0 million US anglers (age 16 or over, 75% male, 92% white) of which 5.3 million (17.7%) fished salt water from boats. 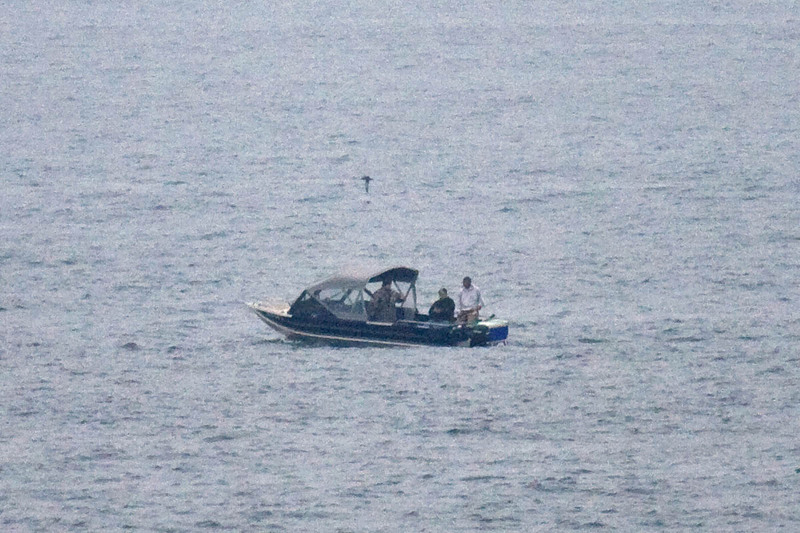 These salt water boat fishers averaged over 11 days fishing at sea during the year. Of the wildlife watchers in the US, 88% watched birds. Of these, 19.9 million watched birds more than 1 mile away from their homes (age 16 or over, 54% female, 93% white). Locally, Oregon had 483,000 fishers (16% of population). If Oregon's average is the same as the US in total, then about 85,330 fished from a boat in the ocean. At an average of 11 trips per year, charter boats carried nearly 950,000 people fishing in Oregon in 2006. Oregon also had 675,000 away-from-home wildlife watchers. If the US average of 88% of these being bird watchers applies to Oregon, then there were approximately 594,000 bird watchers in Oregon in 2006. 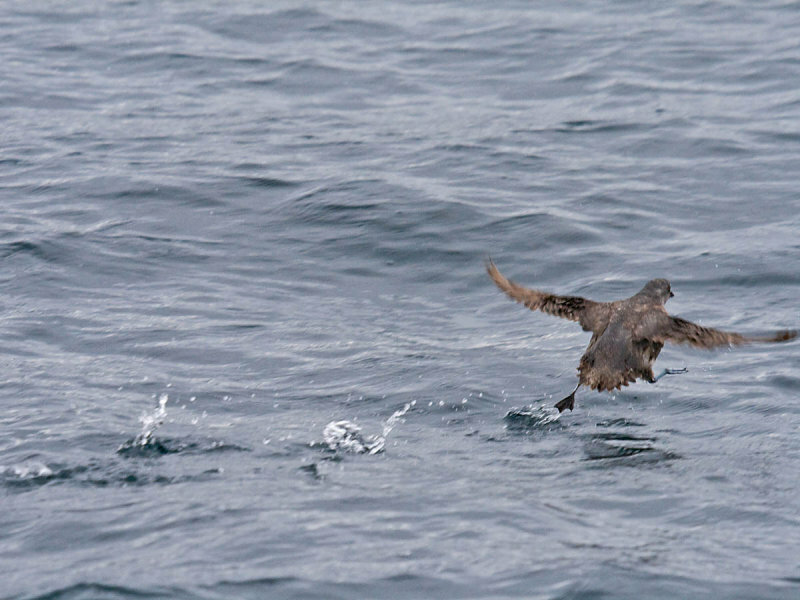 But for now, I want to tie it to charter boats and fishers versus pelagic birders. 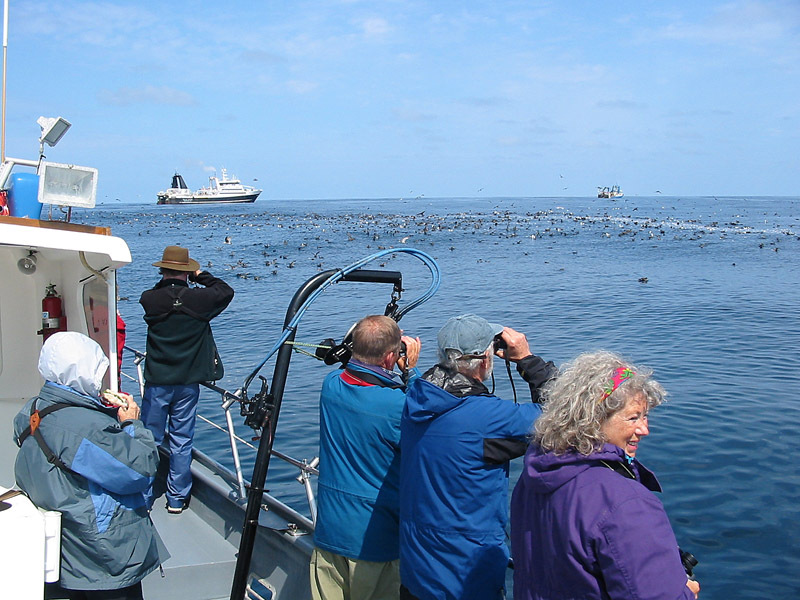 The number of bird watchers joining chartered birding boat trips at sea off Oregon is no more than 250 persons per year. That includes about 20 people who take 2-3 trips each year. So, there are about 20% more bird watchers than fishers, yet in one year, fishers take just shy of a million ocean boat fishing trips in Oregon, while birders take 250. Obviously, there is a tremendous difference in the participation rate of going to sea in boats between the two groups (3800:1). There are several thousand times more fishers in boats at sea than pelagic birders (a topic for a future post). Yet birders seem much more vocal about their emetic experiences at sea. 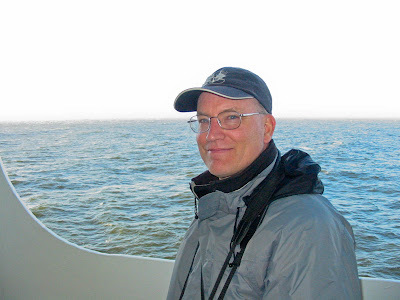 It is very doubtful that birders are more susceptible to seasickness than fishers. No one has studied seasickness more than the Department of the Army. The research concludes that anyone can be made motion sick with the right stimuli. A vertical motion of 0.2 Hertz produces the highest incidence of sickness. Guess what? That's one wave every 5 seconds--just what you might get traveling into a slow swell, or the frequency of wind waves that might be produced by 20 mile per hour winds. What does this mean for birders? Well, be prepared. There are motion sickness medications available. Probably the best is the Scopolamine "patch" worn behind the ear and administered at least 8 hours before getting on the boat. Stay amidships, in the fresh air, where you can see the horizon. Standing and riding the swells, keeping your head level, is better than sitting and rocking with the boat. So, don't give up. Try again! I finally got decent photos of Wrentit on July 30th. It was a bittersweet victory. The only reason I was there in the foothills of the Oregon Coast Range was because high winds had forced the cancellation of our deep water pelagic trip scheduled for that day. Pelagic trips can cancel any time of year. The best month, on average, for calm seas is July. But that didn't matter this day. Winds of 25 miles per hour were creating 6 foot wind waves, which would prevent our charter boat from making any headway and would make viewing conditions abominable. The winds were caused by a thermal low over northern California that creates strong north winds along the southern and central Oregon coast. So here I was, checking out some onshore birding sites instead. It is my intention to create a small birding guide for just such occasions--where to go birding when your pelagic trip cancels (sad face). This location is found on the way to Drift Creek Falls, Site #54 on the Oregon Coast Birding Trail. Head south from Lincoln City and turn E (left) on Drift Creek Rd 1.6 miles, then S (right) on South Drift Creek Rd 0.4 miles, then E (left) on Forest Service Road 17 and go 0.8 miles to the intersection with FS19. Walk this paved but mostly abandoned and unmaintained overgrown road to the southeast into the forest. This is a great spot, May-August, for West Coast forest birds: Pacific-slope Flycatcher, Olive-sided Flycatcher, Western Tanager, Swainson's Thrush, and Varied Thrush among many others. Wrentits are secretive birds that crawl and fly-hop from branch to branch in the dense evergreen tangles of salal bushes. 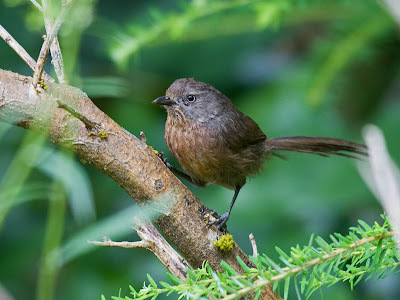 Besides their descending accelerated whistle song, they give rattling little contact notes: "dt-dt-dt-dt-dt" that you may be able to imitate by blowing an unvoiced 'D' through the tip of your tongue (4-6 notes at the rate of about 10 notes per second). Birds respond to this rattle all year, coming close to take a look.